You might think I'm getting better of it by naming the magazine I got inspiration from all the time, but honestley: that's not the case. It's just that I discovered Koel Magazine recently and I'm always very enthousiastic about new discoveries. Usually it lasts a couple of weeks and then: on to the next. Anyway, this pattern I found again on the website of Koel Magazine, under the chapter 'Free Patterns'. 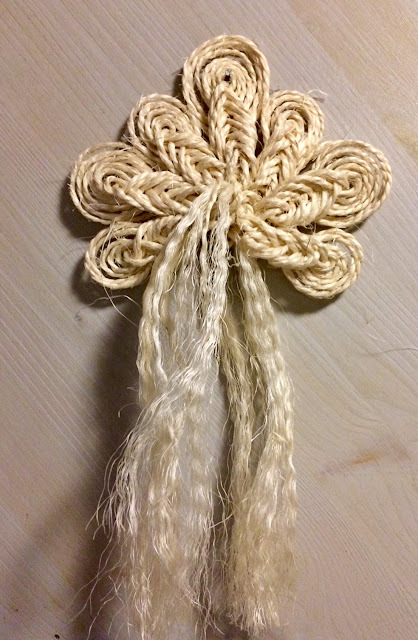 You can find it under Macrame. I had some left over rope from the plant pots and used it to make this Peacock Macrame piece. My Bubble Stitch Cushions were featured by Meet Our Life! My Birthay Party Invitations were featured by Scrapality! Thank you very much, Andrea! Crispin Rabbit is featured by The Linky Ladies! For my daughter's birthday my parents came over to celebrate with her, because on the big day itself she will be on summer camp. 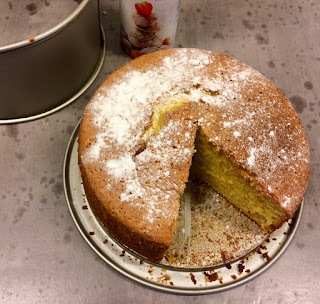 To make the day a bit more festive I baked a Lemon Olive Oil Cake. The taste was good, but the cake was a bit dry though. Luckily I made whipped cream/mascarpone cream for the cake and added a bunch of blueberries on top and that made the whole a bit more moist. For next week I will make a Thai Green Curry Soup. Don't you love all the rich flavours from the Thai cuisine? And it doesn't take a lot of time to make. Perfect! This week my oldest daughter is attending Summer Survival Camp and my youngest is staying with her grandfather and -mother and becuase I have to work just two days this week, I have three whole days to myself. This first day I spend getting some inspiration for the coming fall and winter by shopping in one of my favorite stores, Loods 5. I didn't buy anything, except for plants and candles, because I just bought some new furniture for the kitchen and for the other rooms in my house I just don't need anything at the moment. 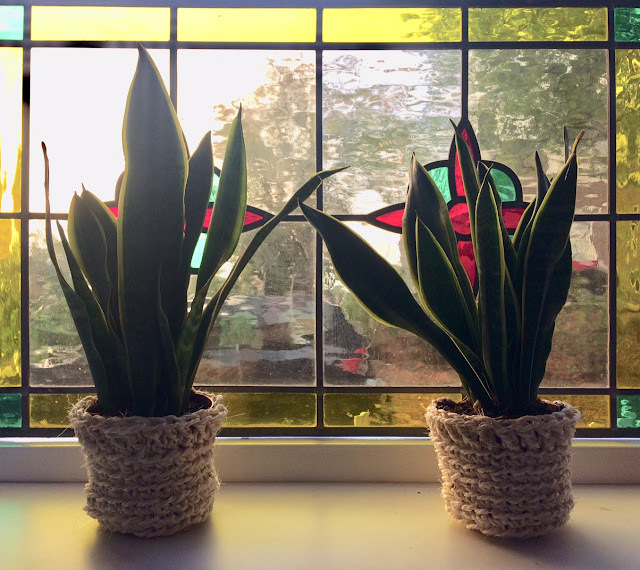 Unfortunately I could find just one plant pot that I liked, but in the Loods 5 store I saw pots made from woven rope or something and that made the idea of crocheted pots pop up in my mind. So back home I bought some rope and started crocheting. You can make these in less than an hour. I really like the result and it isn't that much work at all. Since I discovered Koel Magazine, I crocheted e a couple of patterns from it. Here's another one, not crocheted but knitted. The stitch used is called the Bubble Stitch. Instructions on how to do the bubble stitch you can find on You Tube. I think I finished now, I made all the things I liked in Issue #6. I can't wait until the next issue comes out. Something else: this evening I saw this beautiful, beautiful family swim by. So lovely! 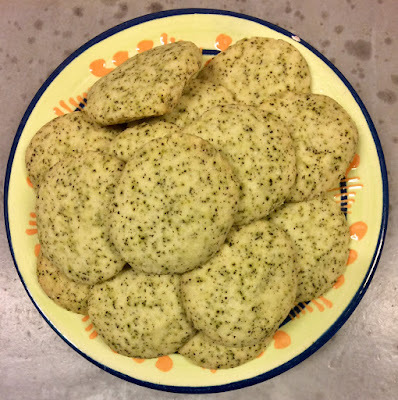 Making these Earl Grey Cookies was something I was really looking forward to, because I love the smell and taste of black tea (the fruity teas are something that I don't like at all, though). Best thing about these cookies, is that they're really simple to make. Just a normal cookies recipe, but with mixed in tea from tea bags. Love it! What I want to make for next week is a Lemon Olive Oil Cake. Because my daughter is on summer camp while she has her birthday, some family is coming over to celebrate the big day earlier, and I think that's a good moment to serve the cake. 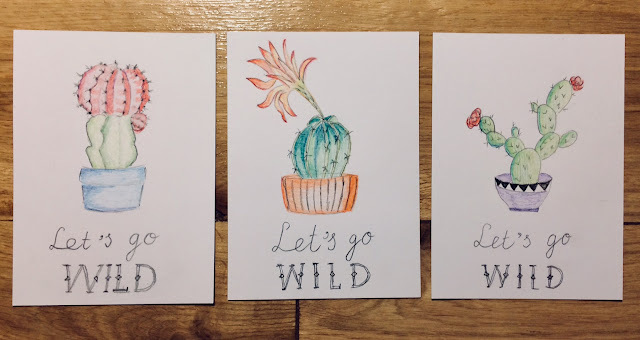 Another item in this year's Birthday Party preparation, with Cacti as a theme, chosen by my daughter the party animal: the invitations! It's been a long time since I made simple drawn invitations, but I like them! 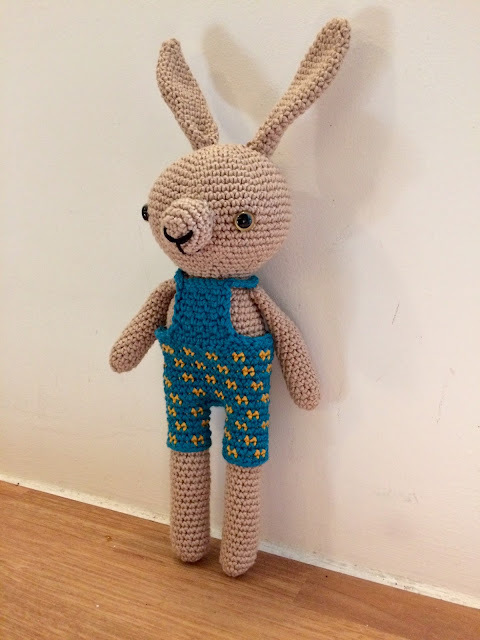 As told in my last post, after crocheting Elena Deer (free pattern here) I became curious and last week I purchased issue #6 of Koel Magazine, so I could crochet Crispin Rabbit. I want to give Deer and Rabbit to the twin daughters of my friend. 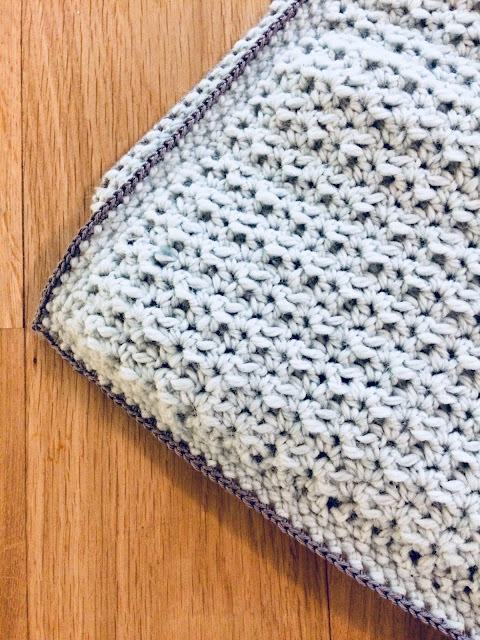 I used Mint Green wool for the blanket and Dark Grey cotton for the edge. 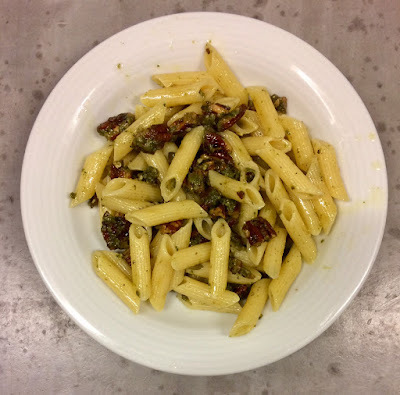 Finally I didn't forget to take a picture of the Pasta Pesto. I made this dish each week the last three weeks, but only this week I remembered to click so I could show you the result. Instead of pinenuts I used pecans, but that's the only thing I altered. The best thing about this recipe is that it's ready in only ten minutes! ~*~ My favorite tea flavour is Earl Grey, I really don't like fruit flavours and such in my tea. Maybe a bit of lemon, but that's it. Earl Grey Cookies sound like the best company for a cup of Earl Grey Tea, so that's what I'm going to try this week! After three months of sunshine every day without one drop of rain, there's rain in the forecast and that asks for tea and cookies. 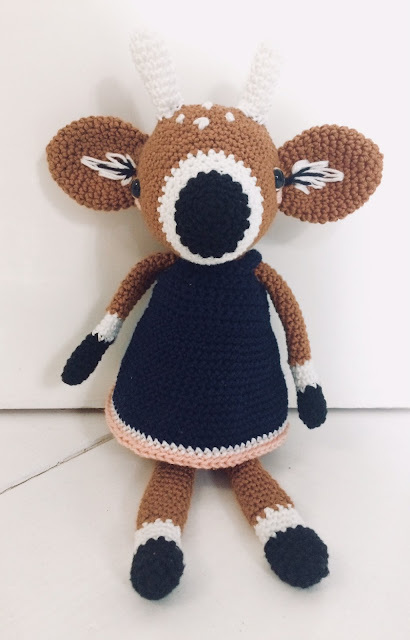 My last post was about Elena Deer, a free pattern by Pica Pau (Yan Schenkel) on the website of Koel Magazine. I purchased Issue #6 of the magazine last week, because in it is a pattern for Crispin Rabbit, another pattern by Pica Pau. In the magazine are nice patterns by other designers, too.Not only for crochet but for other yarn crafts also. The next project from the magazine is on my hook already. Last week I found a new magazine named Koel Magazine. Well, actually it found me and liked some of my posts on my Instagram account, which made me curious and made me want to found out what was Koel Magazine. It happened to be a sort of glossy magazine about yarn crafts. It's quite original, is not only about yarns but also about design and decoration and comes with a lot of ideas, crafty gadgets and information that I had never heard about (punch needling, anyone heard of punch needling before? ), but sure want to try one of these days.The only downside is that the magazine is a bit pricy, but I bought the latest issue anyway. On the website of Koel Magazine I found a couple of free patterns for different yarn arts. 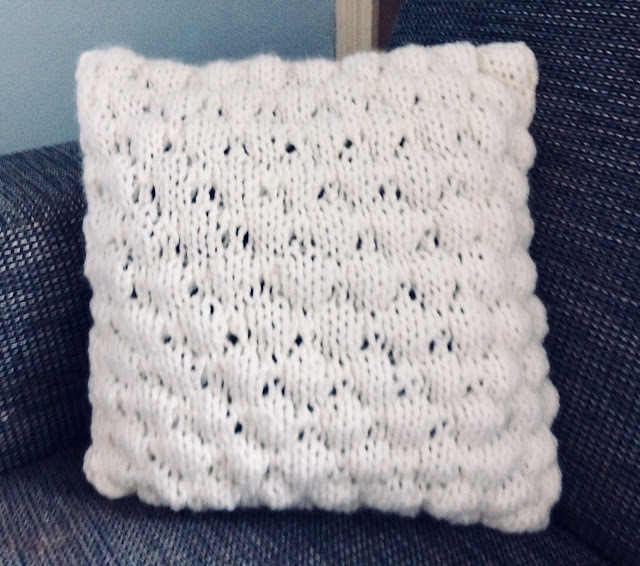 My favorite craft is crochet of course and under the crochet head I found this free pattern from Pica Pau (I've posted my results that I made with her patterns on different occasions here on the blog).